The Mayor and Board of Aldermen of the City of Ridgeland approved a resolution to adopt a Complete Streets policy on August 15, 2017. The policy was presented to the Mayor and Board by the City of Ridgeland Bicycle Advisory Committee. 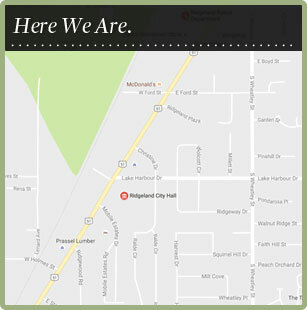 The policy states that the City of Ridgeland will plan, design and construct all new city transportation improvement projects to provide appropriate accommodation for pedestrians, persons with disabilities, bicyclists and motorists and that the City of Ridgeland will incorporate Complete Streets principles. Pictured from left, back, are elected officials: Alderman and Mayor Pro Tempore Kevin Holder (Ward 3), Alderman Bill Lee (Ward 5), Alderman Ken Heard (Ward 1), Alderman Wesley Hamlin (Ward 6), Mayor Gene McGee, Alderman Chuck Gautier (Ward 2), Alderman At-Large D.I. Smith and Alderman Brian Ramsey (Ward 4). Pictured from left, front, are Bicycle Advisory Committee Members, Trey Herron, Sandra Monohan, Jayce Powell and Chris Bryson. Not pictured are Wendy Bourdin, Mike McCollum, Mina Thorgeson and Scott Young.